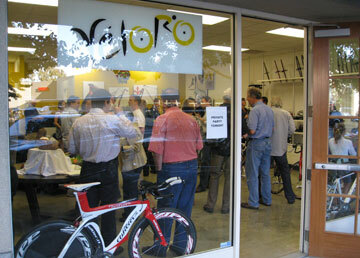 If the opening celebration is any indication, Veloro Bicycles in Redwood City will treat its customers well. The performance bike shop is open for business. It’s a modest-size shop selling road bikes, with names like Cervelo, Scott, Wilier, and Eddy Merckx. Proprietor Mitch Gardina and Store Manager Gebhard Ebenhoech hosted Friday night’s meet and greet to inaugurate the new business. The paint has barely dried and they’re still outfitting the store in the heart of downtown. Gebhard, who has been in the bike industry for decades, says personalized attention to bike fitting will be the shop’s hallmark. Having the proper fit is a big part of how you’ll enjoy your ride. While mingling with guests, I came across several fellow Palo Alto Bicycle employees from the 1980s. 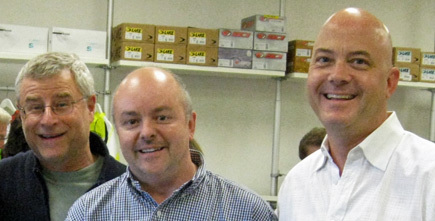 Todd Pugsley, former mechanic, is now an operations manager at a systems/computer hosting company. Michael Johnston, former sales, is a realtor. Terry VerHaar, former manager, is now doing video production. Check out his first show – Bay Area Cycling Scene. There’s a lot to be said about Bay Area cycling. It could make a nice weekly TV show. An ideal time to buy a bike is when a new shop opens. Guaranteed, you’re going to get personalized attention, and that means a lot when buying a bike. Veloro phone (650) 241-1060. This entry was posted on June 26, 2010 at 6:05 pm and is filed under News. You can follow any responses to this entry through the RSS 2.0 feed. You can leave a response, or trackback from your own site.